In the online class I am taking at the Academy of Quilting, I was puzzling over how to shade some circles to make them look like spheres. One of my fellow students provided a link to a video and suggested I try the “melted crayon” technique. I watched the video and got interested enough to try it. I am going to put some of my results here. At the end of this post I will provide links to the video and to a blog post that provides more details. This technique doesn’t require any expensive investment. You probably already own most of what you need. I plan to use this technique for art quilts; the resulting color seems to be reasonably permanent but I would run a sample piece through the washer and dryer several times before I used it on a regular quilt. Here is what you need: your fabric (probably a high thread count white or very light fabric, such as Pimatex) and whatever fusible web you normally use; an applique pressing sheet – one intended for use when you are building up a multiple-piece fusible applique (the fusible is ironed down to this sheet, but can then be peeled up and ironed permanently onto fabric); a box of crayons; some paper napkins; a roll of paper towels for cleanup; and a hot dry iron. If you are not familiar with applique pressing sheets, you may find one at your local quilt or craft store or here is a link where you can buy one on Amazon: Bear Thread Applique Pressing Sheet . This is a link to the smaller, less expensive one (About $12). There is also a bigger one for about twice as much, and there are other brands as well. This just happens to be the brand I have and it works well for me. Here is the process, briefly. You draw whatever shape you intend to use for the applique on the paper side of the fusible web. Then apply the fusible web to the wrong side of your fabric following the manufacturer’s directions. Cut out the applique shape. Press the applique shape onto the applique pressing sheet. You then use the iron to get the applique shape AND the applique pressing sheet very hot. You grab a crayon and rub it on the hot pressing sheet. This makes a little “puddle” of color. You then pick up the color with the tip of a folded paper napkin and transfer it to your applique shape. Like magic, you have “painted” your applique. I am not going to provide more detail about the process because the links I am providing below give you all that. 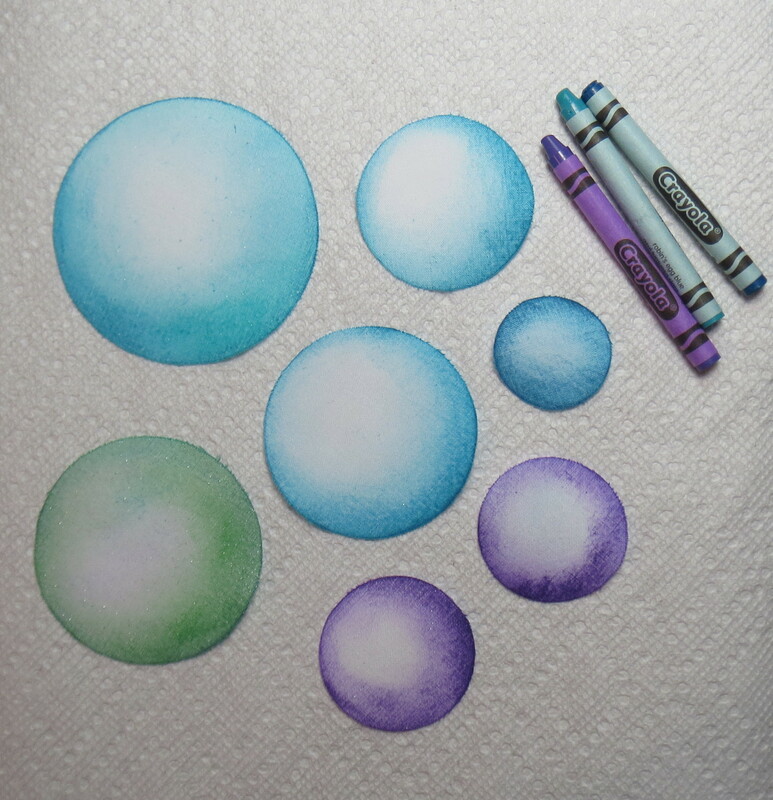 Here are a couple of photos of the spheres I painted using this technique. After completing the coloring, I placed a paper towel over top of the shapes and ironed them to remove any residual color. Then I washed them in hot soapy water; none of the color came out. As always, your results may be different so be sure to run your own test and make sure this process is suitable for your particular project. I also tried a couple of other techniques for coloring the spheres. When I was colored white fabric as shown above, I got the best results with the crayon technique. For colored or dark fabrics, I got better results using Shiva Paintstiks (opaque solid oil paints). I tried some liquid fabric paints also but didn’t get very good results. I suspect that has more to do with my lack of skill than with the products. I recently did a project using the Shiva Paintstiks and will be putting up a post about that project next week. Lots of details and step by step photos in that post, so I am not going to say much else about it here. The melted crayon technique has some nice advantages. You can have a full range of colors for the modest price of a big box of crayons. A small project can be completed quickly with little cleanup since the color is applied with paper – so no brushes to clean. 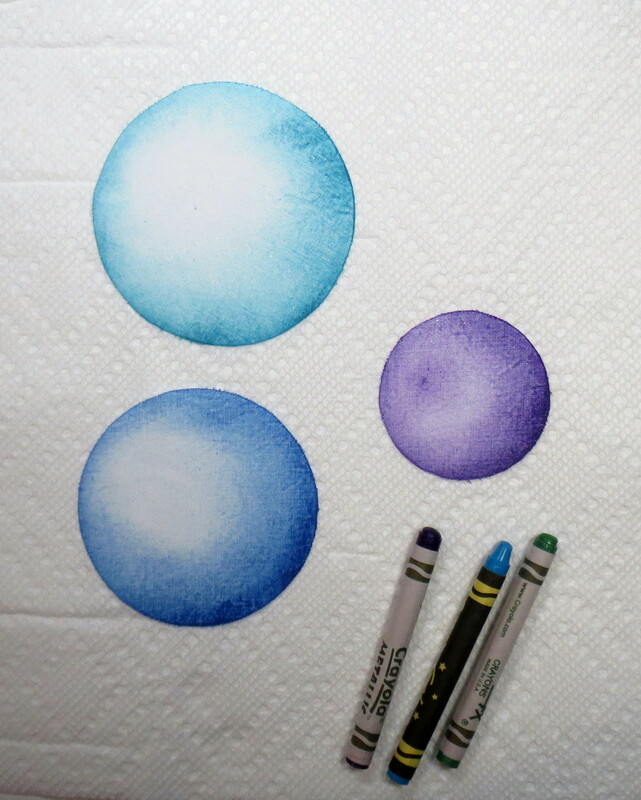 A second or third color can be layered on top of the first one immediately. The color is dry right away – no waiting until the next day or several days for the paint to dry. Here is the link to the video for any of you who are interested: https://www.youtube.com/watch?v=VJN41E2Akto . This entry was posted in applique, Art Quilts, Quilting and tagged art quilts, melted crayons, painted applique, painting fabric with crayons on April 4, 2014 by Shirley at Mystery Bay Quilt Design.